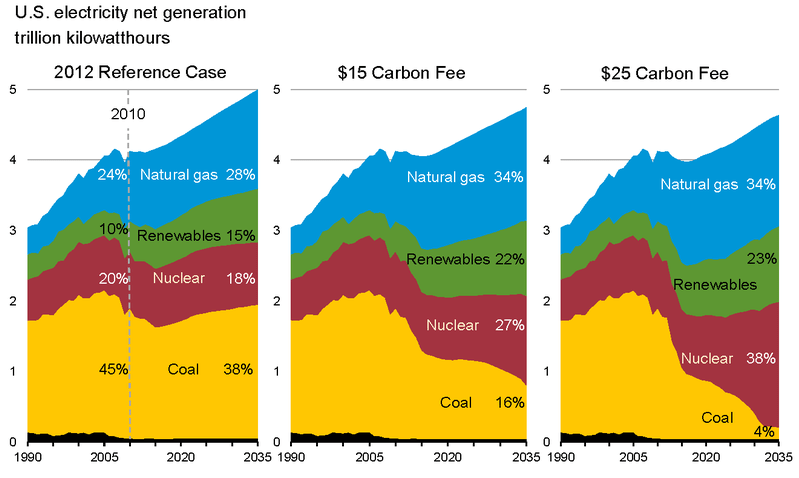 Estimated effect of a carbon tax on sources of United States electrical generation Source: US Energy Information Administration via wikimedia. 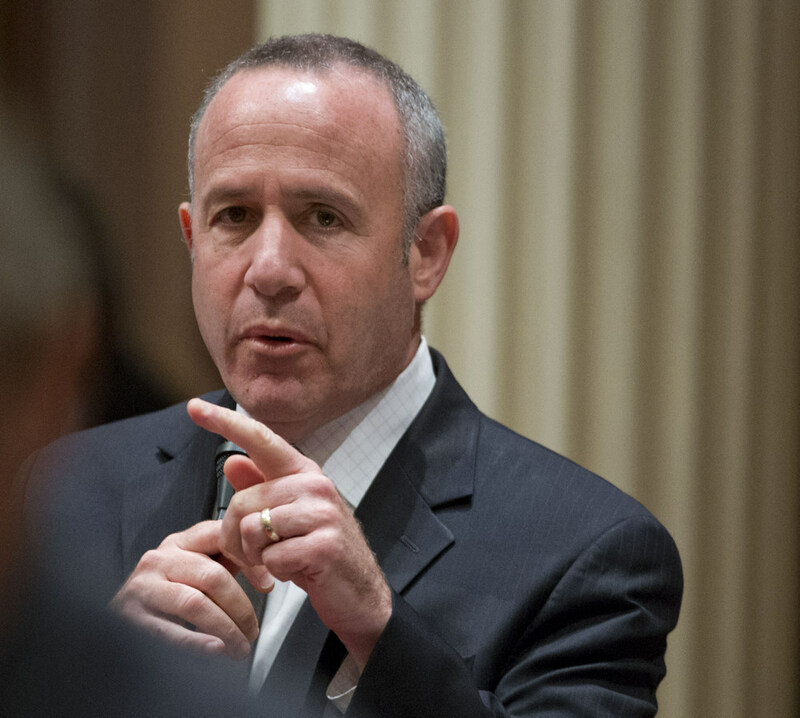 CA Senator Darrell Steinberg proposed a change yesterday to California’s nascent cap-and-trade program that would replace next year’s cap on fuel emissions with a per-gallon carbon tax. Steinberg called it a “broader, more stable, and more flexible” way to reduce emissions from fuels than cap-and-trade. Reactions to Steinberg’s proposal so far have been mixed. The Western States Petroleum Association prefers it as “a transparent alternative” to cap-and-trade, and the Environmental Defense Fund criticized what it sees as a mid-stream switch that could “compromise” CA’s emission reduction strategies. “If this had been offered as a serious proposal seven years ago, we would have thought it was heaven-sent,” he added. “I don’t think it makes sense to reject it outright. It’s certainly worth having the discussion” about cap-and-trade vs. a carbon tax. The California Air Resources Board chose cap-and-trade as a market mechanism to lower greenhouse gas emissions, as authorized under California’s Global Warming Solutions Act (AB 32). Cap-and-trade sets a cap on the amount of greenhouse gas emissions any particular source can produce and creates a market for “pollution credits.” Companies that cut their emissions to levels that are lower than the cap earn credits and then can auction those credits to other companies unable or unwilling to cut their emissions. It’s supposed to produce a net reduction in emissions as well as a stream of revenue for the state, and it has. Governor Jerry Brown’s cap-and-trade expenditure plan for 2014, released in January, includes $850 million from the auctioning of these credits. The cap-and-trade program is even being attacked by the California Chamber of Commerce for making too much money for the state. Carbon taxes haven’t caught on widely in the United States, even though pollution fees are law in several other countries. Among municipal governments, just three have carbon taxes: Boulder, Colorado, Montgomery County, Maryland and the Bay Area Air Quality Management District, which covers nine counties in the San Francisco Bay Area. So far, CA’s cap-and-trade has only applied to stationary sources of emissions. Starting in 2015, however, it is scheduled to apply to fuels. This would mean higher gas prices, which some hope will give consumers an incentive to cut their fuel use, but others fear will lead to higher food prices and heavy losses to small businesses. Steinberg’s proposed legislation, SB 1156, could be an end run around some of these objections. Under the bill, the proceeds of the carbon tax would go to poor and middle-income California families in the form of an earned income credit on their state income taxes. In his speech announcing the legislation, Steinberg proposed that remaining revenues be used to improve and develop mass transit, but the draft legislation does not mention this. Some are skeptical about the likelihood of Steinberg’s bill passing, and others worry about its ultimate effect on California’s climate change policies. The carbon tax sounded good until I read that the petroleum industry liked it! It’s possible that they like it just because it’s simpler, which would actually be an advantage for everyone. They probably also like it because they can directly blame the government for higher gas prices in California on a tax versus with cap and trade. GMO fuel affect the water? WSPA, the fuel industry reps, haven’t “taken a stand” on the carbon tax, but they sure would be happy if it saved them from the cap-and-trade program. It’s also true a straight per-gallon tax would be much simpler and more stable than the complicated auction involved in cap-and-trade. It remains to be seen whether Steinberg can pull off a carbon tax when few have been willing to talk about raising gas taxes. The middle class must feel the sting too. Split the booty equally between politicians and ex-cons who have remained out of jail for one month or longer. Liquid fuels are only a part (slightly below 25%) of total energy consumption. This is absolutely wonderful. There does not need to be an “either/or” debate – carbon tax vs. “Cap and Trade.” As the World Bank demonstrated in a recent paper, each mechanism reinforces the other. We should have both. Well done, Senator Steinberg – and if the Petroleum Industry is on board, we’ve entered a new, and perhaps less hate-filled, era.